CARLY Galligan received her best birthday present inside a doctor’s surgery four years ago. After battling with leukaemia for five years, doctors announced on her 10th birthday that she was cancer-free. “I was so happy,” she said. Carly, of Victoria Point, was diagnosed with leukaemia two months before her fifth birthday. She underwent surgery for a cancerous lump and chemotherapy for nearly three years. “I lost my hair just before prep school,” she said. 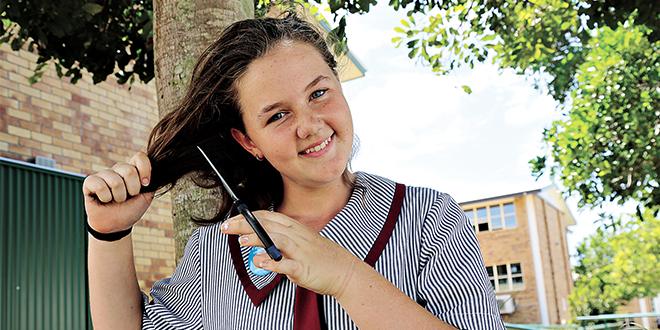 Next month, Carly will lose her hair a second time, shaving it all off at her school Carmel College for the Leukaemia Foundation’s annual fundraiser, the World’s Greatest Shave. She will join more than 150,000 shaving their heads this year, with a goal to raise $2000, enough money to cover the transport costs for a leukaemia patient “who is too sick to drive”. So far the generous teenager has received $1100 from friends, family and her supportive school community at Carmel College, where she is planning to do the shave in March. “It feels really good to help people even though you think there’s so much I have to do just to help this one person, but that one person is now safe because you did something,” Carly said. Carly said support from the community, through the Leukaemia Foundation and hospital volunteers, had taken her mind off her own suffering when she was five. “I thought it was amazing that volunteers would come around to us because they were doing it not to be paid or anything but to make other people happy, even though they might be suffering,” Carly said. Her local parish also remembered Carly in their weekly prayers, and the family even received money from an anonymous donor which helped pay for a large medical bill. Carly’s father Mick Galligan said he was proud of her daughter’s concern for others suffering leukaemia. He said his teenage daughter would like to visit the hospital to play with children diagnosed with cancer. “I’m so proud of her,” he said. Since starting in 1998, the World’s Greatest Shave has given millions towards a cure for leukaemia, an illness affecting around 12,000 Australians.